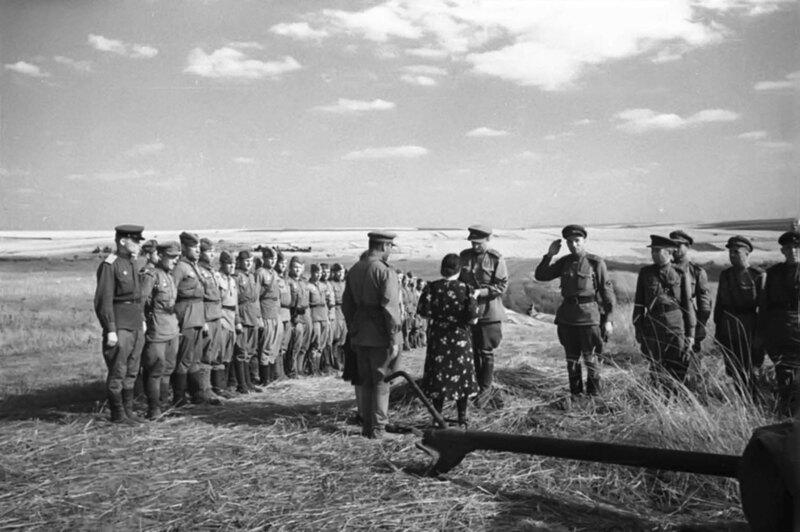 Guards Colonel V. Rukosuev presents to the wife of the younger sergeant Nikolai Mikhailovich Khitrykh, fallen in battle, the Order of the Patriotic War II degree. Khitrykh Nikolai Mikhailovich, born in 1899, a native of the city of Yelets, now the Lipetsk region. Junior sergeant, commander of the gun of the 2nd Fighter Division of the 3rd Guards Fighter Brigade. Communist. Awarded the Order of the Patriotic War II degree for the destruction in one battle of 6 German tanks to a platoon of enemy infantry. The award did not have time to receive – was killed in an offensive from a fragment of an enemy mine on July 25, 1943 in the vicinity of the village of Pokhvisnevo, Kursk Region. He was buried in the battlefield at 2 km. from this village. His family – his wife Anna Nikolayevna and the children of Volodya and Zoya came to receive the award to the fellow soldiers of the hero.